From July 8th through 10th the leaders of the G8 will be meeting in L'Aquila, Italy, hosted by embattled Italian Prime Minister Silvio Berlusconi. The G8 (the Group of Eight) is formed of eight key industrialised nations who meet to discuss issues of international importance and determine key international policies. With this meeting comes a national shame for Canada, for I know that I will have conversations similar to the one below over the next few days with people here in the United Kingdom. “Look, there’s a photo of the G8 leaders. Doesn’t Gordon Brown look like an idiot?” they will say. “The man doesn’t take a great photo,” I will agree. “You’d think Silvio would be a better host, given all the parties he seems to be having for 18 year old models at his residences,” I’ll joke. We’ll all laugh. “Medevev and Obama are in deep conversation in this photo. Probably talking about nuclear missile reductions,” my UK friends will reply. Finally, they will point to the two last leaders. “That’s the PM of Japan,” they will say, pointing to the obviously Japanese guy. “Hmm, I see,” they will say, but they will have already stopped listening; having moved on to checking out the photos of Michelle Obama’s dresses. I just have to learn to accept that nobody over here knows who the Prime Minister of Canada is. The G8 is made up of France, United States, United Kingdom, Russia, Germany, Japan, Italy, and Canada, though most folks would probably struggle in naming that last one, or its leader. Everyone knows Obama, of course. I’d be hard not to, given his almost rock-star like status and constant media coverage. Even if McCain had won though, all the Europeans would still know who is the President of the USA. President of the USA is still the most important office in the world, despite the recent ascent of the BRIC nations. The Brits can all name the European leaders as well. They are after all, part of the big union with them, and all are key trading partners with the UK. Over here we all know the Russian president too, because he keeps cutting off the gas that keeps our heating going in the winter. Japan, well, I’m not actually convinced that anyone knows the Prime Minister’s name, but he’s easy to recognise because he isn’t a white guy. Canada, though, always gets overlooked. 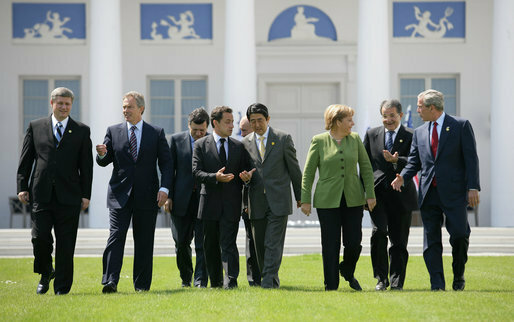 The G8 leaders in Germany in Taken on June 7, 2007, courtesy the White House. Canadian Prime Minister Stephen Harper is walking beside Tony Blair on the left of the photo. That the UK PM was pushed out to walk with the Canadian Prime Minister was no doubt a sign that he was on his way out. Blair was ousted as PM less than three weeks later. This isn't a slight on Stephen Harper specifically, because I bet if Canadian Liberal leader Michael Ignatieff was PM, no one in Europe would know who he was either. Well, probably a couple disgruntled international students at Harvard would be thinking to themselves, "I can't believe that jerk-off Ignatieff who gave me D-minus in my Public Policy course is now Prime Minister of Canada. " The rest of the Europeans, though, would have no idea who he was. That's the place of Canada in the European consciousness today. In fact, when the international group that would eventually morph into the G8 was first formed in 1975, there were only six of the present nations involved. Russia was excluded because, at the time, they were godless communists who kept threatening to nuke the other participants, which isn’t exactly the best way to make friends. Canada wasn’t included simply because no one thought to invite them. Feeling bad about forgetting his little neighbour to the north, the USA President Gerald Ford, who hosted the summit in 1976, invited Canada along. Once the other national leaders saw Canadian Prime Minister Trudeau show up, they shrugged and said, “Well, I guess if you are here now, you might as well join.” Thus the G6 became the G7. 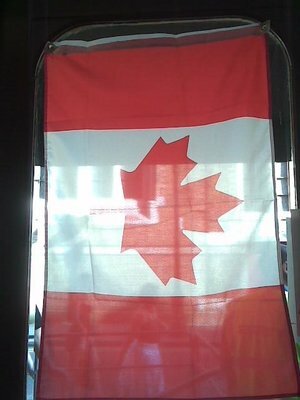 It is only going to get more embarrassing for Canadians like me, I’m afraid. While Canada used to have one of the seven highest GDPs in the world, it has slipped behind Spain, China and Brazil recently. All three of those countries are lobbying to be included in the group, along with India, Mexico, South Africa and Egypt. If the G8 grows, no doubt our lowly Prime Minister will keep getting pushed to the outer fringes of the picture. Maybe you could start a marking campaign for Canada. The slogan could be, "Yes, We're Here!" Haha... nice post. I lived in London for 5 years and it was a nasty reminder of how little the world knows (or cares) about that big country north of the US... what is it called again? Nice blog too... I miss London, I love that place. I'm off to have a bit more of a read to reminisce.